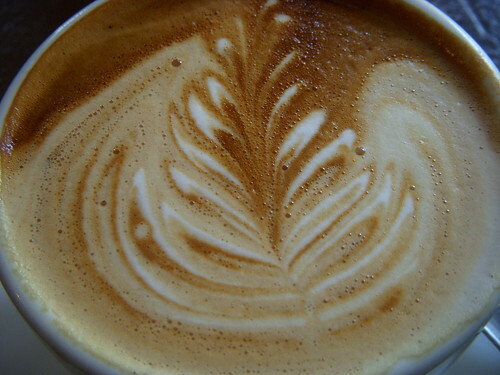 A Day of Triple Espressos….. Hmmm ! I was on my travels again, which usually means in most cases, no espressos for at least a week. So, you won’t be surprised to learn, if you have been an avid reader of my blog, that as I had the opportunity to pass through London for the day on my way back to Vienna, I made a beeline (an English slang for “going straight/directly for…”) for Flat White in Soho. I bust inside, gasping for a flat white of course and thought, “I really need espresso”, so I ordered a triple espresso flat white, made with a bottomless portafilter. The barista looked impressed and went to work and as there was no queue at 10am on a Friday morning, I didn’t have to wait long. I got my camera out so that I can share the experience with you, at least a pic. Before heading out, I snapped up a couple of bags of coffee beans (Flat White blend made by Square Mile Roasters of course) – what else can you ask for when you visit a cafe, triple espresso and some good bag of beans to take home – more about tasting these in the next post God willing. OK ! so the title of this post is “A Day of Triple Espressos….Hmmm !”, so I’m not finished, however, there was an exception, and that was on my visit to Milk Bar (Flat White number two). Well ! I had to have another espresso (actually a double ristretto) after snacking on a delicious roasted falafel sandwich from my favourite sandwich shop in London, Pret-a-manger. 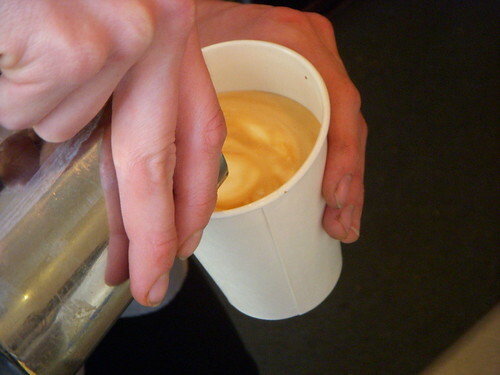 I digress, but I headed to Milk Bar, had a chat with the supervisor, Max, about the lovely black La Marzocco FB70 espresso machine and the grinders (tekky talk), ordered an espresso and walked round the back to take a pic of the other barista pouring a latte. 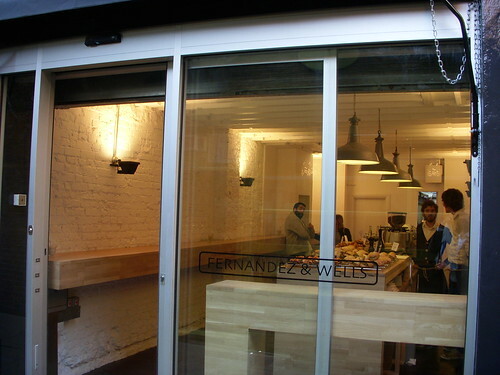 Anyway, whilst talking to Max, he told me that there was a new Fernandez & Wells coffee shop, around the corner at St. Anne’s Court, so I was off, at least to look. St. Anne’s Court is in Soho, sandwiched between Wardour Street and Dean Street on a little pedestrian alley way. Initially, I just went in to chat and see the new concept – Italian style, without chairs and a minimal coffee menu – but I was intrigued when I saw the menu board and said “What is a Stumpy ?” “it’s like a triple espresso mini macchiato…” Well ! I had just had an espresso at Milk Bar, so I decided to break my “no-milk espresso drinks in the afternoon rule” and went for one, or should I say three. 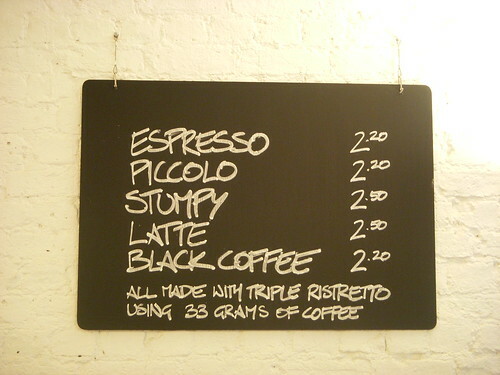 BUT, hang on a minute – it’s actually not a triple espresso, but a triple ristretto – Wow! and if you look carefully at the board, all espresso drinks at this new shop are triple ristretto – now that’s what I call an espresso lovers dream. Anyway the Stumpy was nice, worth a try. Still on a tekky drive, I was lucky to meet with Jorge Fernandez himself – one half of the Fernandez and Wells company. Jorge is really into his coffee and he shared with me that they were trying out a new Monmouth Guatemala espresso blend for 2 weeks at the new shop, took me round to the back of the Synesso Cyncra machine and pulled another triple ristretto. There was tons of crema, but being a bit of a perfectionist when it comes to pictures, my small digital camera (my D60 was at home) couldn’t handle the light, so I just snapped the extraction instead. After 68 grammes of fresh coffee (i.e 1 triple shot of 21 grammes, 1 Fernandez and Wells triple shot of 33 grammes and 1 double shot of 14 grammes) I went straight to the airport, before I got carried away on more caffeine and instead fly to Vienna on Caffeine Air. In any case, I am so glad that there is another new quality cafe in Soho/London and please visit when you get the chance. 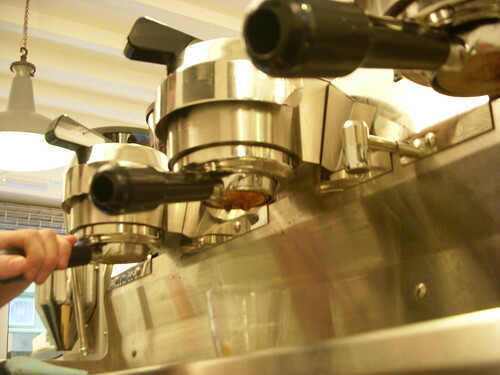 This entry was posted on Tuesday, March 31st, 2009 at 11:06 pm	and tagged with Fernandez & Wells, flat white, La Marzocco, london, Milk Bar, Monmouth, Ristretto, Synesso, Triple Espresso and posted in Bean There - Cafes, Coffee News. You can follow any responses to this entry through the RSS 2.0 feed.